How Hard Is It to Quit Crack? Crack is a form of cocaine that has been further been processed into solid rock crystals that can then be smoked.1 Smoking crack produces a brief but intense euphoria and a surge in energy, which is followed by a crash and a strong urge to use more. It is highly addictive, and many users have trouble quitting without help. Crack is a highly addictive drug that can have negative effects both on the brain and the body. 1 The drug acts on the reward center of the brain by flooding it with dopamine to create a pleasurable high. With persistent use, the brain’s ability to regulate dopamine levels becomes compromised, which may ultimately promote the urge for continued drug use to achieve the rewarding sensation that it grows accustomed to. Better physical health – Crack can cause serious health problems even after one use. Health effects may include headaches, stomach problems, lung disease, heart attack, stroke or even death. Quitting crack and receiving proper medical treatment may reverse some of the negative effects of using crack. Improved nutrition – Crack decreases appetite, leaving many users malnourished, dehydrated and underweight. Quitting crack can provide an opportunity to nourish the body and to treat any health-related complications. Better mental health – Long-term crack use can lead to irritability, anxiety and depression. In some cases, crack users may even experience extreme paranoia and hallucinations. Quitting crack and seeking treatment can improve mental health. Treatment centers are widely available to help people quit using addictive drugs and build a life in recovery. Some crack users try to quit on their own without professional help, while others find the assistance of a treatment program helpful. Relapse prevention – Some people who try to quit on their own find it difficult to stay sober as cravings increase. Treatment centers teach ways to handle urges and difficult situations. Mental health – Many drug users have co-occurring mental health conditions that may contribute to their addiction. Seeking professional help can provide an opportunity to also treat mental health issues. Medical treatment – Many treatment centers are staffed with doctors who can conduct a thorough evaluation and treat any medical issues that resulted from or were complicated by crack use. Inpatient – Clients at inpatient treatment centers participate in group and individual therapy sessions during the day and stay at the facility overnight. Many inpatient programs also introduce clients to recovery meetings and may engage family members in the therapy process. Outpatient – Clients at outpatient treatment centers attend therapy sessions during the day or early evening and then return home after the sessions end. Group counseling – Group counseling or therapy is a component of both inpatient and outpatient therapy programs. One or more professionals facilitate the therapy session, which includes a small group of people. Group counseling can include education on topics such as relapse prevention. It can also allow users to take turns discussing different struggles and to receive support from the group. Individual counseling sessions – These are private therapy sessions held between a client and a therapist. Individual counseling allows for a more personal focus on a client’s issues. 12-step programs – Twelve-step programs follow the philosophy of Alcoholics Anonymous. These programs teach the 12 steps to recovery, introduce attendees to recovery meetings and help them build a support network of other sober individuals. Treatment typically lasts from a few weeks to a few months. However, recovery is a long-term process and is not over once treatment ends. Aftercare occurs after treatment. It includes various forms of continued treatment support at a point during which a person gradually transitions back to old routines and post-rehab life. Having a good aftercare plan can minimize the chances of a relapse and help people adjust back to life outside of treatment. Sober living facilities offer temporary housing for people in recovery. Also known as “halfway houses,” sober living homes are typically run by a house manager who enforces a drug-free environment, mandatory drug testing, house rules and a curfew. Some people find the structure of sober living homes helpful after inpatient treatment. 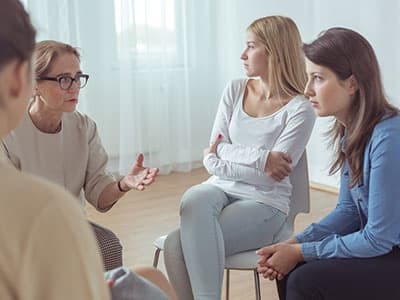 Outpatient treatment is often recommended after completing inpatient treatment in order to continue therapy sessions and provide support in early recovery. Some clients gradually decrease the number of therapy sessions they attend each week. Psychotherapy is also recommended after completing inpatient and outpatient treatment. Meeting with a counselor or a therapist at least once a week provides an opportunity to work on ongoing issues related to addiction or to mental health concerns. 12-step meetings are free recovery meetings for people struggling with addiction. As mentioned in the previous section, these meetings focus on teaching the 12 steps to recovery, sharing recovery-related stories and building a support network. People struggling with crack addiction may find help in Narcotics Anonymous and/or Cocaine Anonymous. Family members also can find support in Nar-Anon and/or Families Anonymous. Non-12-step meetings include SMART Recovery, Women for Sobriety, LifeRing Secular Recovery and Secular Organizations for Sobriety. These meetings offer evidence-based tools and support for people struggling with various addictions. Reach out for help. Find a local therapist, attend support groups, make new sober friends or join a 12-step program. Having a support network of sober people can make quitting easier. Avoid triggering situations and people, especially early in recovery. It is challenging for many people to leave their former lifestyles and develop new friendships and hobbies. Exposing yourself to triggering situations, such as friends you used drugs with, can significantly increase the chances of a relapse. Create new, healthy habits. During addiction, it’s common to disregard responsibilities. Part of recovery involves developing new habits to create structure and to increase confidence and accountability. For example, you might consider developing a morning ritual that includes making your bed, practicing gratitude and meditating. Have a relapse prevention plan.This plan can include a list of coping skills to use if you feel triggered or have a strong craving. You also can keep handy the contact information for other sober people to reach out to as well as a list of the reasons why remaining sober is important to you, or why you wanted to quit using drugs in the first place. Enter a recovery program. Quitting crack is difficult to do alone. Seeking professional help is recommended, especially if you have a history of failed attempts or think you may need support. Relapse can occur if you don’t address the reasons that led to using crack in the first place. Seeking treatment provides an opportunity to look at core issues and learn new ways of coping. Approaching a loved one about addiction may lead to some resistance because many drug users don’t want to admit that they have a problem. Avoid approaching them in the following ways, which can result in tension and may have a negative impact on their decision to seek help. Don’t confront them about their addiction in a judgmental way. They may find it difficult to hear what you have to say if they feel disrespected or judged. Anger is a normal emotion when dealing with a loved one’s drug use. But it can hurt the relationship if it is expressed aggressively. Threatening or coercing the person into getting help often backfires, and it may make them more resistant to treatment. Be gentle in the words, tone and body language that you use. This conveys respect and may make your loved one more receptive to what you have to say. Come from a place of concern. Saying “I’m worried about you” is more likely to get your loved one to listen than threatening or shaming. Offer a solution to the problem, such as going to treatment. Present it in a non-judgmental way so that the person feels like he or she has a choice, rather than being forced to go. The psychological symptoms can be more difficult than the physical symptoms. Some crack users experience mild physical symptoms that subside within a few days. However, heavy crack users or those with a history of medical or mental health problems may experience more severe symptoms that might require professional attention. Medically supervised detox may be necessary in some cases. Many users also relapse due to the psychological symptoms of crack withdrawal, which can be harder to manage than the physical symptoms. Use of other drugs in addition to crack. Severe depression and suicidal thoughts also may occur during crack withdrawal. It is important to call 911 if you have thoughts of harming yourself or others. Medical symptoms can be a problem. In most cases quitting crack cold turkey is not dangerous. 2 However, some people experience medical complications. Symptoms such as headaches, chest pains, irregular heart rate and seizures should be taken seriously. If you experience these symptoms, seek medical assistance immediately. Cravings can lead to the temptation to use again. Quitting cold turkey without treatment also can put a person at a high risk of relapse. Cravings often accompany withdrawal symptoms and can lead a person to begin using again. This may create a cycle of failed attempts to quit. Users are at risk of depression and suicide. Some crack users experience depression during withdrawal. In some cases, depression can become severe enough to bring about suicidal thoughts. If you experience thoughts of suicide, seek assistance from a professional or call 911 immediately. Seeking medically supervised detox and/or treatment can minimize medical and psychological complications and reduce the chances of a relapse. Crack is a difficult drug to quit because of its effects on the brain. Crack causes large amounts of dopamine to build up between the synapses of neurons.1 This results in a short but pleasurable high. Many crack users develop strong cravings for the intense high, making it difficult to quit. In 2013, there were almost 70,000 admissions to treatment centers for crack addiction. 3 Some of these admissions may have been people admitted to rehab several times throughout the year, since crack has a high potential for relapse. Despite being hard to quit, treatment centers are available to help manage the difficulties of quitting crack, including providing relapse prevention tools, building a sober support network and treating mental health issues that may be related to addiction. If you or someone you care about needs help quitting crack, call our helpline at 1-888-319-2606 Who Answers? to speak with a representative who can assist you with finding a treatment program.
. National Institute on Drug Abuse. (2013). DrugFacts: Cocaine.
. Substance Abuse and Mental Health Services Administration, Center for Behavioral Health Statistics and Quality. (2015). Treatment Episode Data Set (TEDS): 2003-2013. National Admissions to Substance Abuse Treatment Services. BHSIS Series S-75, HHS Publication No. (SMA) 15-4934. Rockville, MD: Substance Abuse and Mental Health Services Administration.